How to Maintain Mink Eyelashes for a Long Time? It is a great decision if you have finally decided to get lash extensions. Undoubtedly, mink eyelashes are the best you can get today. It looks natural, beautiful, fuller, and feels pretty comfortable after applying. The process of applying these eyelashes may seem a bit tedious but you will look pretty charming once the job is done. You should obviously apply makeup like shadow, eyeliner, etc. to make your eyes look attractive. You will look gorgeous but after the event, go gentle with the makeup removing process. Every product you use for removing eye makeup is not great for maintaining eyelashes. A lot of women prefer cotton pads to remove shadows and other makeup. It is okay to use cotton pads when you are not using eyelashes. 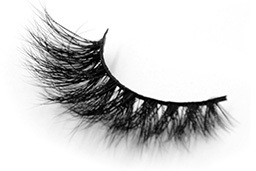 Cotton fibers not only loosen the eyelashes but also mess them up. You should prefer using a cleansing wipe to remove your makeup perfectly without messing up with your eyelashes. You should strictly avoid sleeping on your stomach or sides if you have recently applied mink eyelashes. It is pretty harmful for those lashes because the glue will take some time to dry. There is no issue if you are already a back-sleeper. The side-sleepers and stomach-sleepers will find it daunting to do but it is important for maintaining mink lashes for a long time. Some might find it a crazy suggestion because many suggest to keep the eyelashes dry to ensure their long life. Well, it is not a flawless suggestion because dry lashes get messed up very quickly. You should use baby oil to maintain flexibility and smoothness of your eyelashes. That’s how you can keep your eyelashes long, strong, and impressive. Use your fingers to apply the baby oil and strictly avoid applying oil through a cotton pad. This might be a bit harder for many women but it is very important. Do not try to pull or push them when you are thinking about your eyelashes. There is no need to twist them because if you will do, it will damage your newly applied mink lashes. So, now you have got something new to comb and you will love it. Buy a spoolie wand to comb your lashes. Keep one eye closed when combing and that’s how you can perfectly maintain your mink lashes. All these simple tips are suggested by the leading eyelash technicians. Follow them and your eyelashes will remain charming and perfectly glued for a long time.